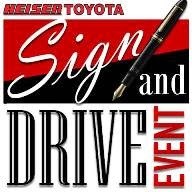 The Heiser Toyota Scion Sign & Drive Event Is Going On Now! +Heiser Toyota Scion has just announced their Sign and Drive Sales Event.This allows you to get into a new eligible 2014 model with $0 down, $0 security deposit and $0 first payment due at signing.It’s an outstanding opportunity to drive a new, fuel-efficient Toyota vehicle today! That’s right. With zero down you could drive away in a new 2014 CAMRY LE, leasing for just $249 a month! Or, choose to lease the all-new2014 Toyota COROLLA L for only $199 a month, again with no money down!! I invite you to experience the convenience, selection and dependable service that IS Heiser Toyota. See for yourself just why we say “Anything’s Possible”. I look forward to welcoming you to our dealership. To get directions to Heiser Toyota Scion: CLICK HERE.